Friends see the lush green plantings at our house and exclaim, "Oh, you have such a green thumb! What's your secret?" I say, "I water them," and they look at me in disbelief. But watering not watering enough, or watering so much that plant roots get soggy may be the biggest issue for those who think their thumbs are black. Fortunately, it's often an easy problem to solve. Polymer moisture crystals are one of the best watering aids I've found. Polymer moisture crystals are like magical little garden helpers. They mop up little puddles of water around roots so plants don't drown. They release the water back to the roots as the surrounding soil dries out, keeping plants from wilting between waterings or rainfalls. If you price them by weight or volume, they seem expensive, but a little bit goes a very long way. They take about 3 years to break down, so they'll last a while in your garden, too. Polymer moisture crystals look like coarse salt crystals. They absorb up to 300 times their own weight in water, until they look like little cubes of jello (see photo above). They then release the water slowly back to the soil, keeping it evenly moist between waterings. Good drainage is still important, but by absorbing excess water the crystals help guard against the "wet feet" that make many plants unhappy. Polymer moisture crystals are a boon to container gardeners. Without moisture crystals added to my potting mix, I could water containers on my sunny deck twice a day, and I'd still have drooping, thirsty plants. By using the crystals, I can even skip a day once in a while, especially if it's not really hot outside. I always add them if I'm planting a container for a non-gardening friend. Since they help protect against both overwatering and underwatering, the crystals allow for beginner inconsistencies. 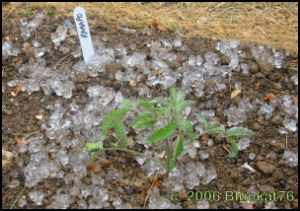 Garden transplants benefit from polymer moisture crystals also. 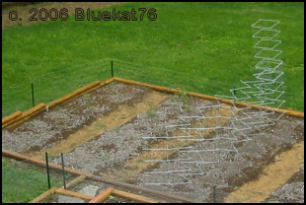 You can till them evenly into the top 6 inches of the garden bed, or you can sprinkle them down into planting holes. In a few seasons, according to the manufacturer, they will break down harmlessly into nitrogen, carbon dioxide, and water. They are nontoxic and safe to use on food crops. 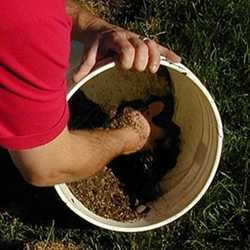 The crystals are also helpful for putting in new lawns or areas of ground cover. 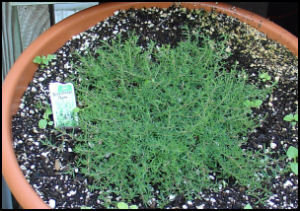 When I plant creeping thyme along the edge of a bed or a walkway, I scratch a sprinkling of moisture crystals into the soil around the plants. The extra moisture held by the crystals encourages runners to root and form new plants for additional coverage. If you're putting in a new lawn, adding polymer moisture crystals before broadcasting seed or laying sod will provide an extra moisture boost for the first few years and get your new turf off to a great start. Be sure to water long and deeply, so water gets down to the roots and so the crystals have a chance to soak up some extra moisture. I add polymer moisture crystals to my potting mix for starting seeds or propagating cuttings, where keeping an even moisture level can be crucial. A smaller size crystal is nice for shallow seedling trays, and you can break the crystals down to a finer texture by putting them in a propeller-type coffee grinder. Sifting afterwards to remove any finely powdered crystals is helpful. Powdered moisture crystals have their own uses, and you can purchase powdered polymer or reduce regular crystals to powder in a coffee grinder (take care not to ingest or breathe in the powder). Rehydrated into a slurry, powdered polymer makes a great root dip for bare root transplants. 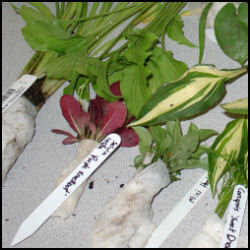 When I wrap bare root plants for shipping, I put a slap of rehydrated polymer onto a moist paper towel and wrap it around the root ball before wrapping the roots in plastic. How much should you use? When you're adding polymer moisture crystals, it pays to follow package directions. More is not better! Adding too many crystals to a pot can result in plants heaving right out of the container as the crystals swell with water. 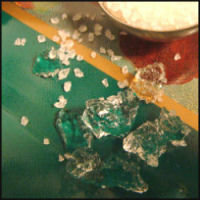 Add enough of them, and after a good rain you'll see a "snowfall" of jello cubes spilling from your containers out across your patio. 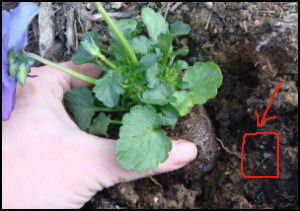 Even without overdoing it, you may see a few swollen crystals on the surface of your soil or potting mix. 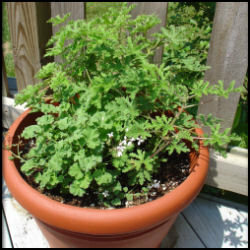 If you don't like the way that looks, just use a couple inches of plain mix to top off your pots. 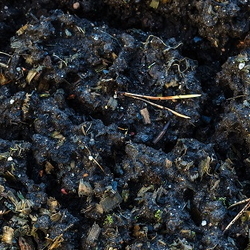 Both SoilMoist and Watersorb post application rates on their websites. It works out to about 2 teaspoons per gallon pot (less for a "trade gallon"), or 2 rounded tablespoons per 5 gallons of potting mix. With transplants, I sprinkle about 1 tsp. in the planting hole for a 6 inch pot or for a tomato seedling. When planting out from 2 to 4 inch pots or for smaller plants like peppers and basil, I sprinkle about ½ teaspoon in the hole. The application rate is roughly the same as for pelleted, time-release fertilizer (such as Osmocote or Dynomite). 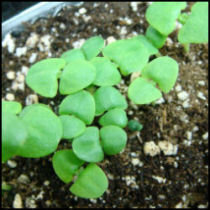 In fact, I often mix a jar of half fertilizer pellets and half moisture crystals to use when I plant out seedlings. Where can you buy polymer moisture crystals? Nurseries, home improvement centers, and mail order companies carry 8 to 12 oz. jars of brands such as SoilMoist. For great prices on 2 pounds or more, check out Watersorb.com. There have also been DG co-ops for Watersorb. The single best thing you can do for your plants is to give them enough water. 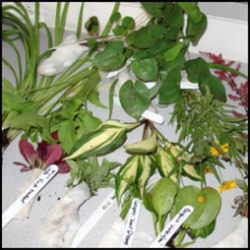 Adding polymer moisture crystals is an effortless way to give your plants an extra water supply. 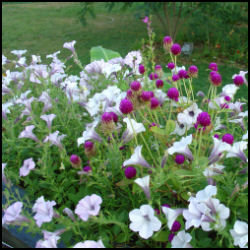 I've used them in potting mix, in my clay soil, and in my in-laws' sandy soil. Of all the gardening aids and culture techniques I've tried, using polymer moisture crystals has made the biggest difference to the vigor and success of my plants. If you don't use them already, I hope you'll give them a try this summer. They really work! Thanks to Bluekat76 for the use of her "oops too much" photos. Other photos in this article are by the author. University of Florida studies in 2000 and 2001 showed that the addition of Watersorb increased yield and net revenue for tomato crop by 5%, peppers by 24%. See this summary by Polymers, Inc.